It's hard to remember your manners when you think you're about to die. The human species may have developed an elaborate social and behavioral code, but we drop it fast when we're scared enough  as any stampeding mob reveals. That primal push-pull is at work during wars, natural disasters and any other time our hides are on the line. It was perhaps never more poignantly played out than during the two greatest maritime disasters in history: the sinking of the Titanic and the Lusitania. A team of behavioral economists from Switzerland and Australia have published a new paper in the Proceedings of the National Academy of Sciences (PNAS) that takes an imaginative new look at who survived and who perished aboard the two ships, and what the demographics of death say about how well social norms hold up in a crisis. The Lusitania and the Titanic are often thought of as sister vessels; they in fact belonged to two separate owners, but the error is understandable. Both ships were huge: the Titanic was carrying 2,207 passengers and crew on the night it went down; the Lusitania had 1,949. The mortality figures were even closer, with a 68.7% death rate aboard the Titanic and 67.3% for the Lusitania. What's more, the ships sank just three years apart  the Titanic was claimed by an iceberg on April 14, 1912, and the Lusitania by a German U-Boat on May 7, 1915. But on the decks and in the passageways and all the other places where people fought for their lives, the vessels' respective ends played out very differently. To study those differences, the authors of the PNAS paper  Bruno Frey of the University of Zurich and David Savage and Benno Torgler of Queensland University  combed through Titanic and Lusitania data to gather the age, gender and ticket class for every passenger aboard, as well as the number of family members traveling with them. They also noted who survived and who didn't. With this information in hand, they separated out one key group: all third-class passengers age 35 or older who were traveling with no children. The researchers figured that these were the people who faced the greatest likelihood of death because they were old enough, unfit enough and deep enough below the decks to have a hard time making it to a lifeboat. What's more, traveling without children may have made them slightly less motivated to struggle for survival and made other people less likely to let them pass. This demographic slice then became the so-called reference group, and the survival rates of all the other passenger groups were compared to theirs. The results told a revealing tale. Aboard the Titanic, children under 16 years old were nearly 31% likelier than the reference group to have survived, but those on the Lusitania were 0.7% less likely. Males ages 16 to 35 on the Titanic had a 6.5% poorer survival rate than the reference group but did 7.9% better on the Lusitania. For females in the 16-to-35 group, the gap was more dramatic: those on the Titanic enjoyed a whopping 48.3% edge; on the Lusitania it was a smaller but still significant 10.4%. The most striking survival disparity  no surprise, given the era  was determined by class. 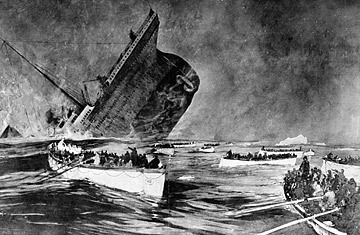 The Titanic's first-class passengers had a 43.9% greater chance of making it off the ship and into a lifeboat than the reference group; the Lusitania's, remarkably, were 11.5% less likely. There were a lot of factors behind these two distinct survival profiles  the most significant being time. Most shipwrecks are comparatively slow-motion disasters, but there are varying degrees of slow. The Lusitania slipped below the waves a scant 18 min. after the German torpedo hit it. The Titanic stayed afloat for 2 hr. 40 min.  and human behavior differed accordingly. On the Lusitania, the authors of the new paper wrote, "the short-run flight impulse dominated behavior. On the slowly sinking Titanic, there was time for socially determined behavioral patterns to reemerge." That theory fits perfectly with the survival data, as all of the Lusitania's passengers were more likely to engage in what's known as selfish rationality  a behavior that's every bit as me-centered as it sounds and that provides an edge to strong, younger males in particular. On the Titanic, the rules concerning gender, class and the gentle treatment of children  in other words, good manners  had a chance to assert themselves. Precisely how long it takes before decorum reappears is impossible to say, but simple biology would put it somewhere between the 18-min. and 2-hr. 40-min. windows that the two ships were accorded. "Biologically, fight-or-flight behavior has two distinct stages," the researchers wrote. "The short-term response [is] a surge in adrenaline production. This response is limited to a few minutes, because adrenaline degrades rapidly. Only after returning to homeostasis do the higher-order brain functions of the neocortex begin to override instinctual responses." Once that happened aboard the Titanic, there were officers present to restore a relative sense of order and to disseminate information about what had just happened and what needed to be done next. Contemporary evacuation experts know that rapid communication of accurate information is critical in such emergencies. Other variables beyond the question of time played important roles too. The Lusitania's passengers may have been more prone to stampede than those aboard the Titanic because they were traveling in wartime and were aware that they could come under attack at any moment. The very nature of the attack that sank the Lusitania  the sudden concussion of a torpedo, compared to the slow grinding of an iceberg  would also be likelier to spark panic. Finally, there was the simple fact that everyone aboard the Lusitania was aware of what had happened to the Titanic just three years earlier and thus disabused of the idea that there was any such thing as a ship that was too grand to sink  their own included. The fact that the two vessels did sink is an unalterable fact of history, and while ship design and safety protocols have changed, the powder-keg nature of human behavior is the same as it ever was. The more scientists learn about how it played out in disasters of the past, the more they can help us minimize loss in the future. See the best pictures of the week. See the editorial cartoons of the week.